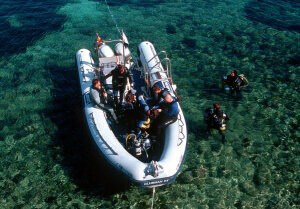 Daily snorkling trips to the nature reserve dragonera island. The warm, cristal clear blue water and the surroundings of dragonera island is a very special events for the whole family. We will reach the island within 5 minutes, there you can snorkel, swim or sunbath for about 1 hour. Or do you prefer a sightseeing tour around the island or the lonely westcoast with ist beautiful coves? That’s also possible, you will see majorca from another perspektive.